Polish Medical Standard Society (POLSTMED). The Minister of Health - Professor Zbigniew Religa and the Mayor of the City of Cracow took the volunteer patronage of the Symposium. The leading theme of the Symposium was Evidence-Based Health Care (EBHC) - a health care system based on scientific evidence. Choice of the matter was the result of pressing need of changes in Polish health care system as well as evident evolution towards EBHC observed in health care systems of the neighbouring countries. Director of the Institute of Health Sciences, University of Oxford. Director of the National Library for Health. Programmes Director of the National Screening Committee of the four UK Departments of Health. Director of Clinical Knowledge Process and Safety for the National Programme for Information Technology in the Department of Health. Professor of Public Health. Head of the Department of Public Health, Henri Mondor Hospital, Paris. Former Evaluation Director in the French Agency for Health Technology Assesment – HAS (Haute Autorité de Santé; French National Authority for Health). Director of Medical Technology Unit of Swiss Federal Office of Health (till 2005). Director of the department of quality assurance and service provision of KBV. Director, Health Economics, Policy and Payment at Medtronic, Inc.
Head of Department of Medicines Hauptverband der österreichischen Sozialversicherungsträger (Main Association of Austrian Social Security Institutions). Head of University Center for Healthcare Quality. Ministry of Health consultant on standards and quality assurance in health care. Project manager, projects of National Policy of Quality in Health Care. Vice-president of the Czech Society for Health Care Quality. Head of the German Agency for HTA (DAHTA/DIMDI – German Institute for Medical Documentation and Information). Director of the Public Health Center, Leon Kozminski Academy of Entrepreneurship and Management, Warsaw; a member of the Senate of this Academy, senior researcher, lecturer and consultant; organizer of scientific conferences and seminars, including PhD seminars. His main fields of interest are: health care financing systems, especially health insurance, Evidence Based Health Care (EBHC), management and economics of health technologies and information systems in health care. The speaker is also a member of the Scientific Council of the Center of Postgraduate Medical Education and vice-dean of the College of Methodology and Organization of this institution. Director of the Department of Pharmacology, National Institute of Public Health, Warsaw, Poland. Deputy Director for Medical Affairs, National Health Fund. Director, Health Technology Assessment Agency (AOTM), Poland. Chief Executive Officer of HTA Consulting. 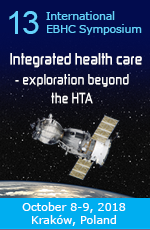 Member of Board of Directors Health Technology Assessment International (HTAi). Director of International Projects of CEESTAHC. President of the CEESTAHC Society. Organizer of the international "HTAi Annual Meeting 2004" (head of the conference office) and the "International EBHC Symposium Priorities in health care 2006". An EBM, HTA and PhE specialist of several years’ experience, an author of more than ten training programs and HTA research analyses. Director of the Department of Health Insurance of the SIGNAL IDUNA Poland Insurance Company S.A. (implementation of the first offer of health insurance in Poland covering hospital care). Office Director and President of the Polish Medical Standard Society (POLSTMED). A senior lecturer at the Institute of Health Economics of the Medical University of Silesia (ŚAM) in Katowice. Board Consultant in medical market affairs at TUV NORD POLSKA sp. z o.o. Lecturer at BWST in Żywiec. Manager of Health Economics Dept. at the Sanofi-Aventis Group. Screening and therapeutic programs in highly developed countries, in which concept of EBHC (Evidence Based Health Care) is accepted, are estimated as to their efficacy and safety, costs and profitability as compared to alternative options. This estimation is performed prior to consent to implement a specific program and allocation of any means to it as well as some time after implementation. All screening programs must fulfill basic screening criteria, accepted worldwide. Both criteria of decision making and naming a screening program as well as British successes in the field will be presented by Sir Muir Gray – the EHBC “guru”, who introduced the term. Professor Sir Muir Gray is one of the most widely recognized experts worldwide and the guardian of rational expenditure of public means for screening programs in Great Britain. Polish experience in the field and proposed directions of change will also be presented. A benefit package is a selected set of medical services, procedures or interventions covered by health insurance of a specific kind. In this session principles of benefit packages creation will be discussed on example of countries, in which the packages constitute one of the basic tools of the health insurance system. Dr Pedro Koch will discuss more than 20 years of Swiss experience in this field. Possible directions of future systems and packages development will also be presented. Pedro Koch is one of the most experienced experts in Health Technology Assessment (HTA). He was responsible for quality approval of reimbursement applications in Switzerland. He also took part in reimbursement decision-making (on including drug and non-drug technologies into a package) as the Director of BSV. Additional insurance turns out to be an essential element of a well-developed medical services market. The market of voluntary supplementing and additional insurances in Poland is estimated at ca. 0.7 to 1.2 billion PLN, as compared to 36 billion PLN in the National Health Fund and 60 billion PLN in the whole health care system. Creation of a sufficiently large non-standard benefit package would open new area for supplementing and additional insurances, worth even 10-15 billion PLN per annum. In this session concepts and possibilities of development in such health insurance will be discussed and experience of other countries will be presented. ore or less structured priority setting in health care means selection of medical services financed from public means and setting the order in which they will undergo prior analysis and/or standardization. In this session principles, means and experience concerning setting of priorities in health care and analysis will be presented. Influence of results of analyses as well as political factors on priority setting at different levels of the process will be discussed. Apart from results of efficacy and safety analyses or economic and financial analyses other factors, such as patients' preferences, social expectations and availability of infrastructure are taken into account in many countries. Estimation of their importance in selected countries will be presented. Setting of priorities in analysis is necessary, especially because of limited means that may be allocated to analyses before reimbursement decisions are made. That is why health technology assessment agencies worldwide perform so-called “horizon scanning” – monitoring new health technologies before they are registered or otherwise introduced into the system. Poland neither has its own “early warning” system nor takes part in any such international system for priority setting in health care. Standards and guidelines may be compared to road signs and lines, which regulate traffic and increase security on the road. Road signs and lines are most important in relatively dangerous parts of the road. Also standards and guidelines are created for these areas in medicine, which require systematization due to clinical, financial, legal or organizational considerations. Along with practice guidelines various standards concerning quality of products, equipment or management are introduced worldwide. Standardization in health care, including especially medical services and their conditions, became necessary and its role will grow along with increasng possibilities of diagnosis and treatment, better access to information and changes in the health care system. Standards in health care system are sometimes connected with each other; thus standardization requires careful coordination. Efficient implementation of standards requires commitment of all the parties involved – success is not possible without understanding between them. In this session Polish and foreign experience in creation and implementation of standards and guidelines will be discussed, as well as perspectives for their development in the health care system. In this session model solutions and directions of change of drug reimbursement systems worldwide will be discussed. Not only the aims and principles of creation of reimbursed drugs lists, but also evolution of law and regulations concerning this problem in selected countries will be presented. In relation to general concept of EBHC role of transparent rules of reimbursement system function, ensuring health security of the society and optimal use of limited means ("value for money"), will be discussed. Polish experience and directions of planned changes in this field will also be discussed.